Every time I type ‘apron’ it comes out as aprong. 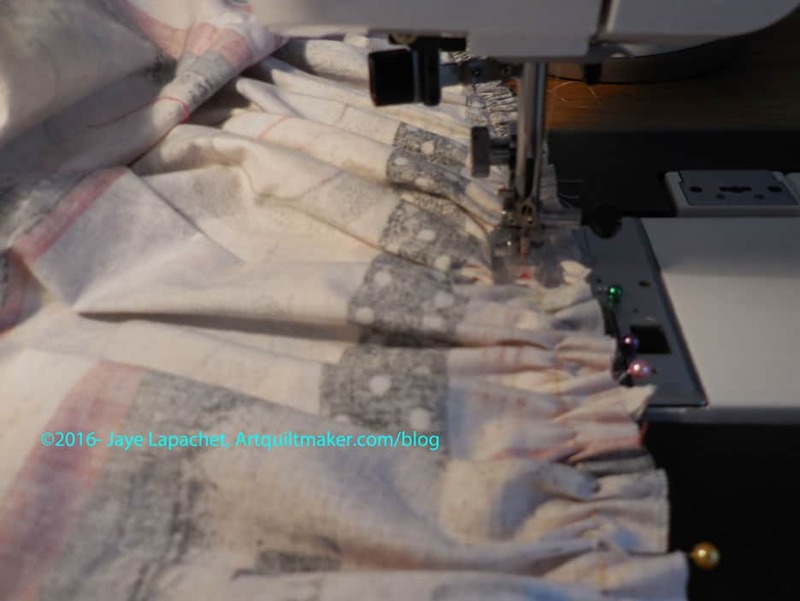 I am not sure why, but it may mean that I need to stop making aprons. 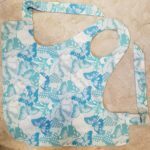 I finally finished my Flapper apron. 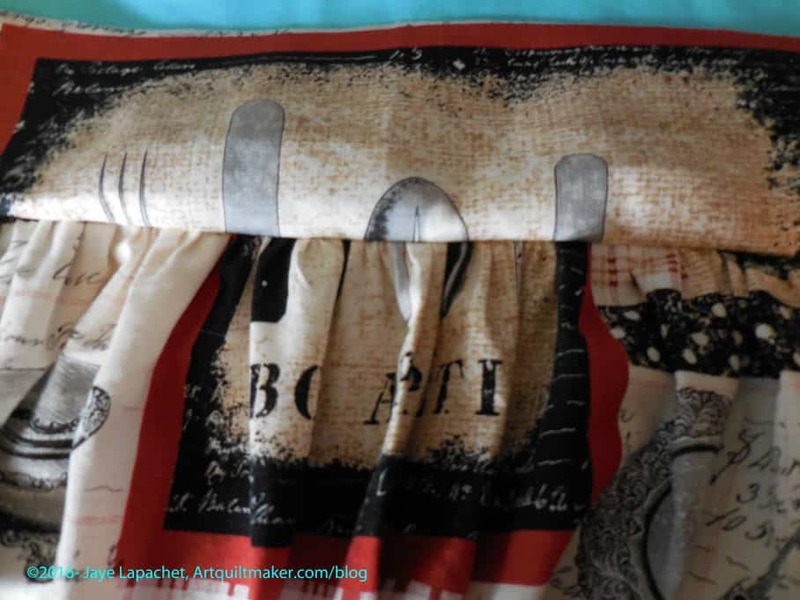 I have been using the Church Ladies apron I made awhile ago, though it is not perfect. I don’t like the interfacing in the handles, because it makes them hard to tie. I also don’t like the construction. I made a Flapper apron for myself awhile ago. The neckline was too long and gaped, so I didn’t like it for myself. It was the one I put in the Fair last year and was well sewn. It couldn’t compete against the tailored blazer in the same category (ERGH!!! ), but I still did my best. I never wore it so I sent it off to a friend who admired it. Why not? She loves it. I adjusted the pattern a little bit on this newest version and the neckline is much better. Not as long, so it doesn’t gape. I haven’t tried it out, but will soon. 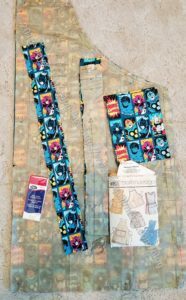 I finally made this Flapper Apron from the Decades of Style pattern company. I purchased it at the Speckled Hen during my shop hop with Amanda in January. Not too shabby, actually. Not that much time has gone by. 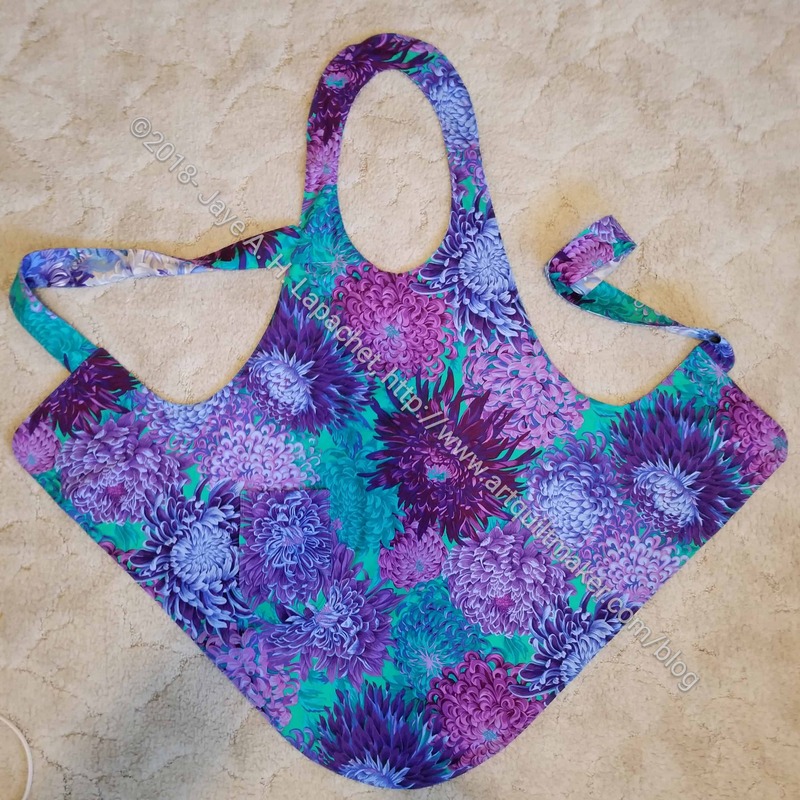 Frankly, I am on a mission to use up at least 100 yards net of fabric this year and these aprons take two yards. I have an idea to make a series of them for gifts and this was the first one. It is for me and I used some of my my recent Philip Jacobs fabric purchases. 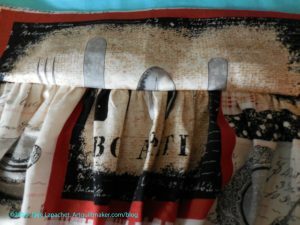 I am kind of sorry I used this great fabric to make the first one, a sort of test, but I firmly believe I should use my good fabric. 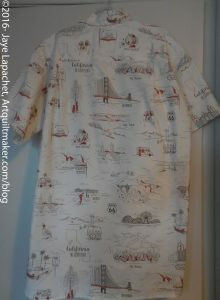 I also firmly believe there is more fabric, so I suppose I have more fabric I love and can make another apron if this one isn’t up to par. This is two sided, so I can turn the inside to the outside if I want. I put one pocket on both sides. I only need a pocket for my phone as I don’t put spoons and other kitchen gear in my apron pockets. The other thing I need to think about is the neck. I thought I didn’t need to adjust the circle for the neck, but I like my aprons to cover almost up to my neck. In this case, the top of the body of the apron falls below that. I think this is a case in which I should have had SIL#2 help me do the fitting. 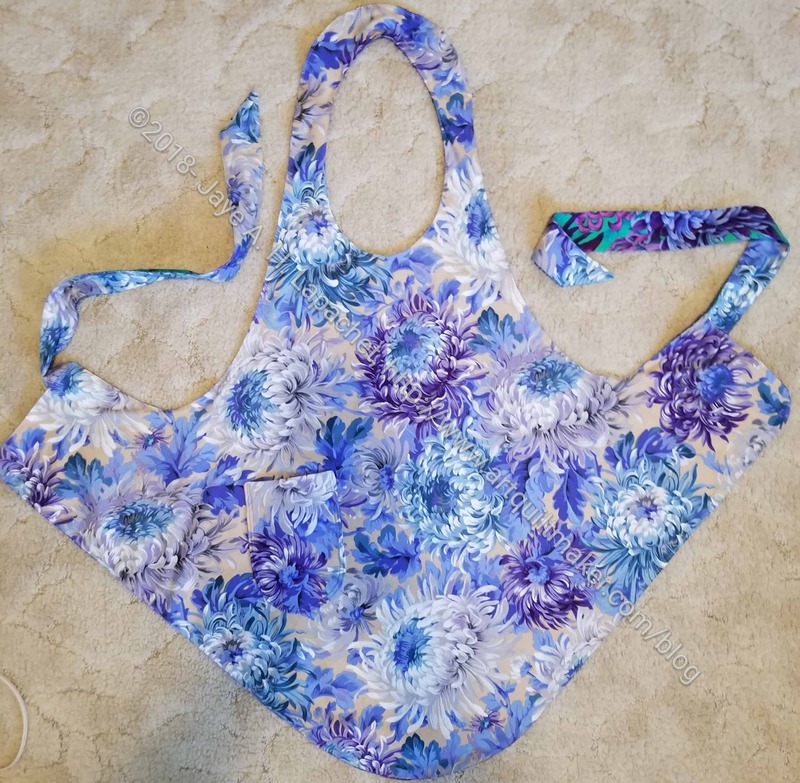 This apron was not difficult to make and I like that you use 1 yard of fabric (though I bought 1/25 yards and that gave me some room to maneuver) and is cut on the bias. I was able to finish it in a few hours during one day. 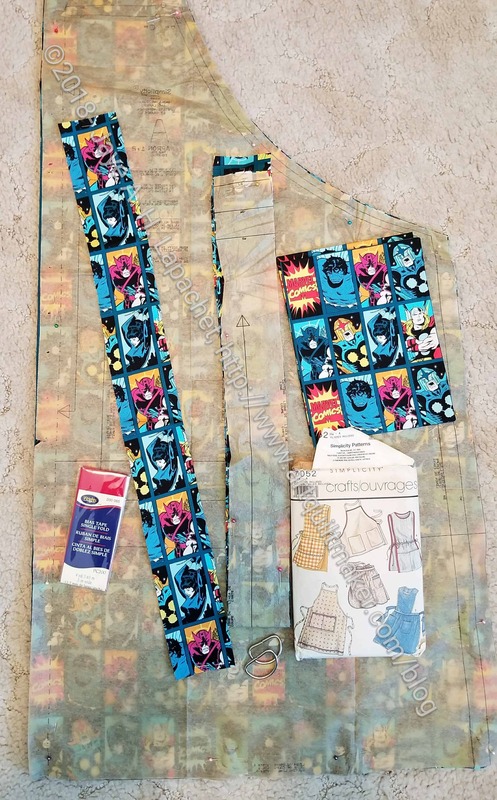 I did make some changes to the construction based on my recent experience making the Superheroine apron. 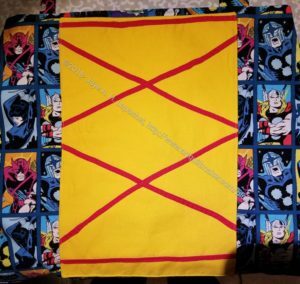 The Superheroine apron is done. 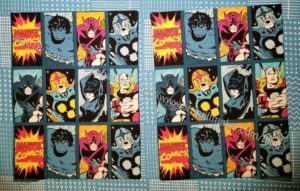 This, however is a project that has to be shown at guild, then shown at the fair before it can go to its intended recipient. As mentioned previously, I had all the pieces cut out. I had started to do little bits and bobs, but Friday, I worked on it in earnest and, shockingly, I got it done. I was sort of surprised to see how much of me was covered when I tried on the apron. My niece is a bigger girl than me, so I think it will fit just fine. The yellow is an addition that I made that is supposed to look like a lace up front. I am not sure it does, but at least I tried. I had to recut several pieces, because they weren’t right after I decided to add a D ring at the top. 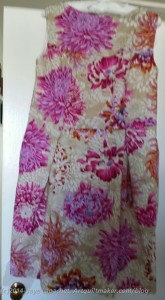 I also made the apron lined by cutting out two body pieces and sewing the RST. I talked to Mary and then looked up how to make D Rings work on the web. I wanted the neck to be adjustable, so the apron is comfortable. YAY! Another must-do off the list! 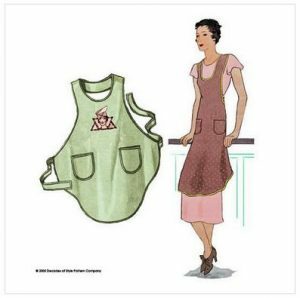 Now I am tempted to make the Decades of Style Flapper Apron I bought when I was out with Amanda last time. I want to make them for gifts and now would be a good time. I’d also use A LOT of fabric. We’ll see. 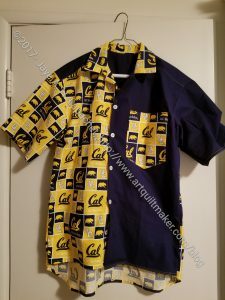 Even though he expressly said he had enough Hawaiian like shirts, I couldn’t resist making DH another shirt with Cal fabric. He calls it his bowling shirt, which is a little annoying, but it is his shirt. 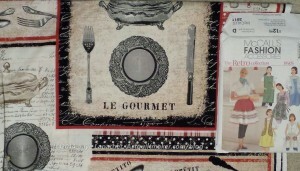 I am planning to enter it into the fair this year. I started another shirt. 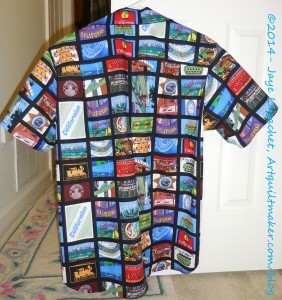 The last one I made was the California shirt I entered into the San Mateo County Fair. 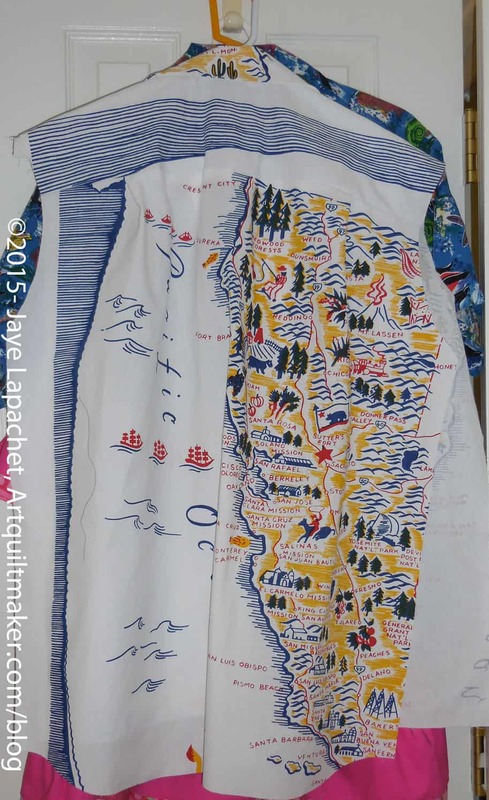 Like many of my quilts, I think these shirts are part of a series. 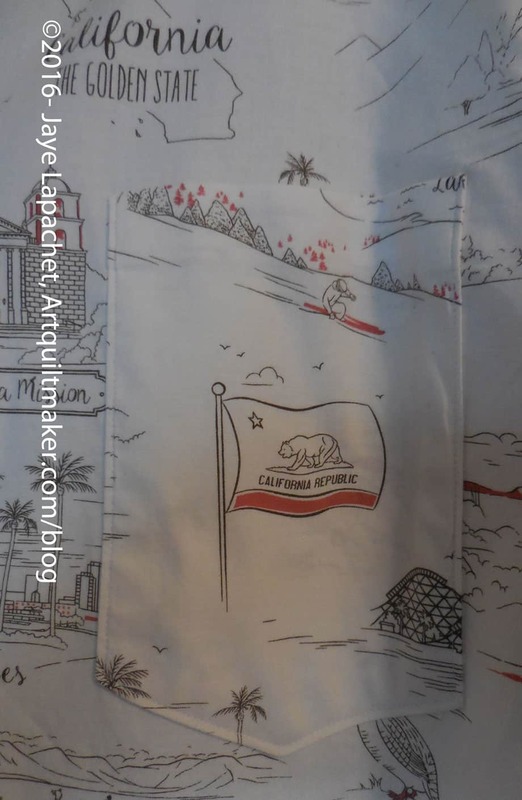 The California shirt from last year is the best yet. The judges weren’t 100% happy with my entry and they were correct. I needed to finish the seams. This failure has been on my mind. 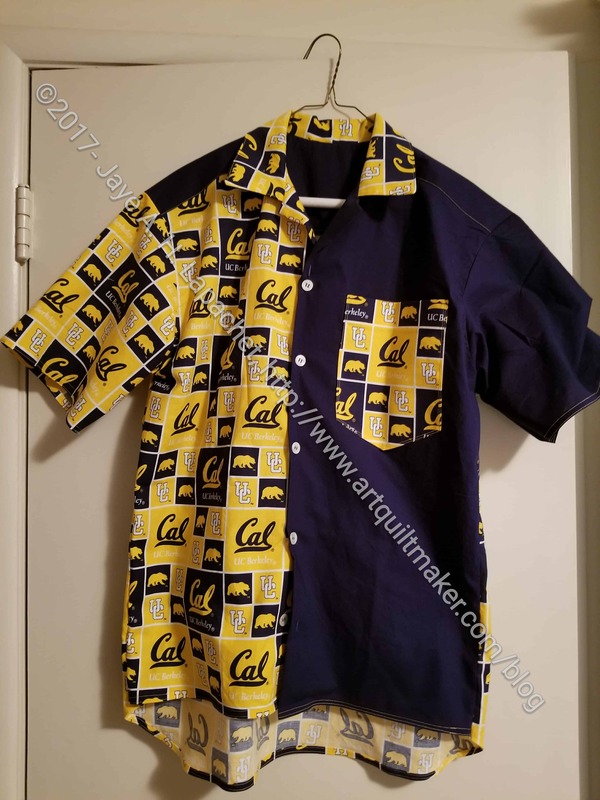 A series of events made me decide to make DH a Cal shirt. 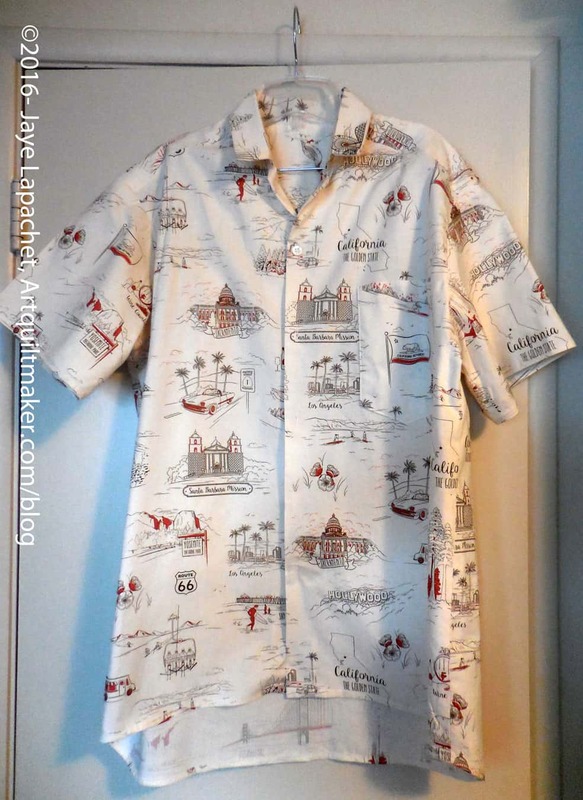 He says he has enough button down casual type shirts, but he is getting this one anyway. 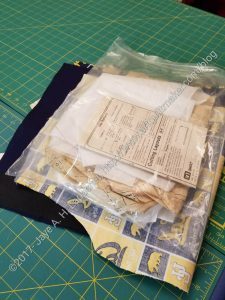 I had some Cal fabric that I used for various things, but I bought some more at PIQF. It turned out that when I cut out the shirt on Monday, I had enough from my previous purchase to cut the pieces. I also decided that I would use some dark blue solid on the shirt so that motifs would stand out. I didn’t want the overall effect to be too chaotic. The cutting went really well. I modified the pattern last time and that took a lot of time. I didn’t have to do that this time, so I was able to cut out the shirt and fuse interfacing to the front of the shirt all during Craft Night. I still need to fuse some ShapeFlex to the pocket to keep it from being floopy. You might remember the Amanda Jane Cafe Apron? I made 3 or 4 of them and sent them off to new homes. Apparently, my sister loves hers and uses it at her art shows. She ripped a few seams so when I went to visit the YM she gave it back to me to fix. 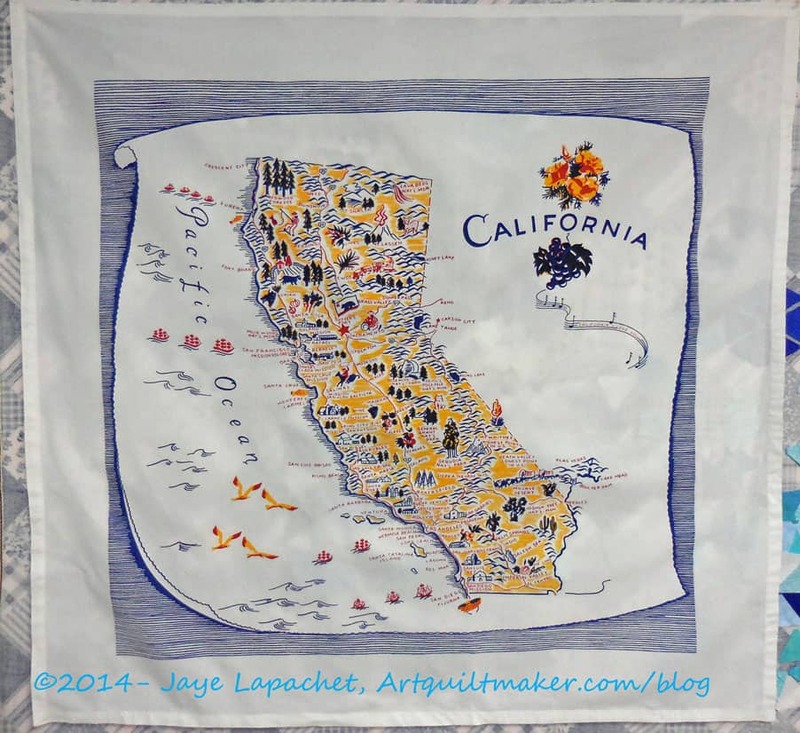 I have been working diligently on the art quilt, so it took me a few weeks to get to it. I took a break from the art quilt and did some piecing. One of the other things I did was fix Lil Sissy’s cafe apron. I reinforced seams, which I am shocked I didn’t do before. I also backstitched some seams that I thought would get stressed. My sister was very good natured about it and I appreciated that. I finished this apron months ago and for some reason could never get myself together to take a photo. I finally gave myself a good talking to and got it done. It is still in relatively pristine condition because I haven’t used it. I am saving it to enter in the San Mateo County Fair. 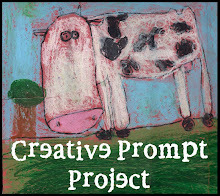 SIL and I are trying to enter a number of projects so we can beef up the display area. If you are in the area, please enter something! After not looking at it for months, I wish the colors had been different. I am not big on that beige or the rust. I really like the motifs and am really happy with the fussy cutting I did. I had a lot of help with this piece. Kelly helped me cut it out about a thousand years ago and Mom helped me with the gathering, which was just about the last thing I needed to do to finish it. I decided yesterday that I would give this apron to one of my nieces who needs an apron. I told her she wouldn’t get it until after it is exhibited at the Fair. 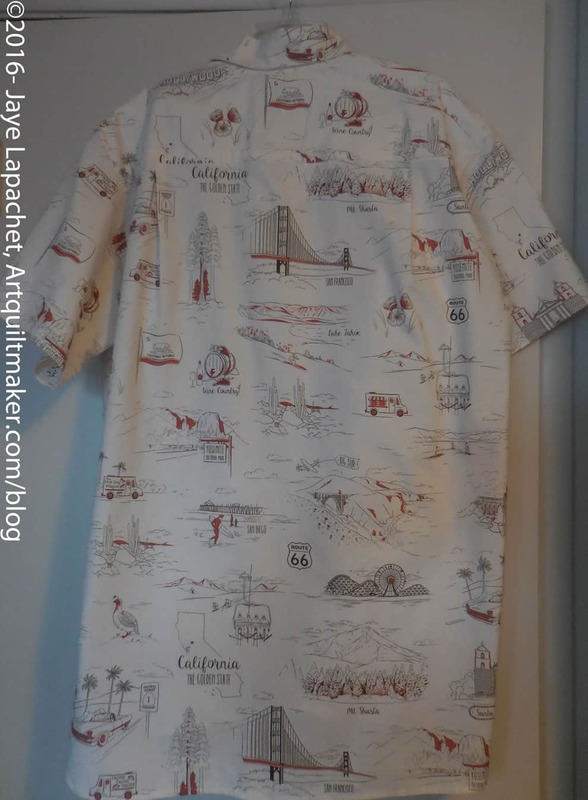 The other day I talked about the shirt I made for DH for Christmas. I decided I wanted to talk a little more about the details. The motifs lend themselves to fussy cutting and where I could I tried to use that technique to make the shirt more special. It didn’t always work out. I cut out the collar with the state capital beautifully centered and realized that it would come out upside down. Oh well. I did succeed on the pocket. I wanted to make the pocket larger since he has a larger cell phone now. 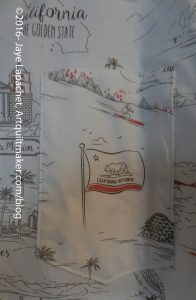 Larger pockets can be floopy so I lined the pocket with ShapeFlex to give it some bulk and make it stronger. Pockets aren’t that large so I was able to find a scrap that worked really well. The flag will draw some attention from the Native Sons. I have successfully made buttonholes I like at TFQ’s house on her Bernina. I have never figured out how to use the buttonhole foot on my Janome 9000. I did get a lesson on the DC5100 and I knew it wasn’t difficult. I hauled that little machine over to SIL’s (the YM came over and carried it home for me when we finished) and used it to make the buttonholes. I took a prepared scrap over and did a couple of test runs. The test buttonholes came out beautifully, so I decided to go for it on the shirt. Failure. I got and error message, the start of a buttonhole, then a straight stitch going in the wrong direction. 🙁 SIL said that she needed to make a project with 100 buttonholes in order to feel confident. Very true, for many things, I think. I eventually made the machine work by turning it off and on again between each buttonhole. It was a pain and I had to reset the settings each time, but I got all of the buttonholes done. The buttons came out of a jar that TFQ bought for me at Road to California. I really like them and think they fit the look of the shirt very well. 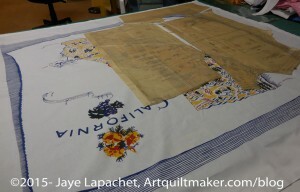 The photo directly above has a great shot of one of the missions on the fabric design. PSA: If you aren’t already sewing for #BDSI, get to it. I am on my way to contribute my tweets and grams! I am not sure why I do this to myself. Garment sewing is hard. Fortunately, my SIL lives around the corner and she held my hand throughout the process. I worked on this only at her house until Friday when I pressed it and wrapped it. I know why I made this shirt, actually. It was all about the fabric. 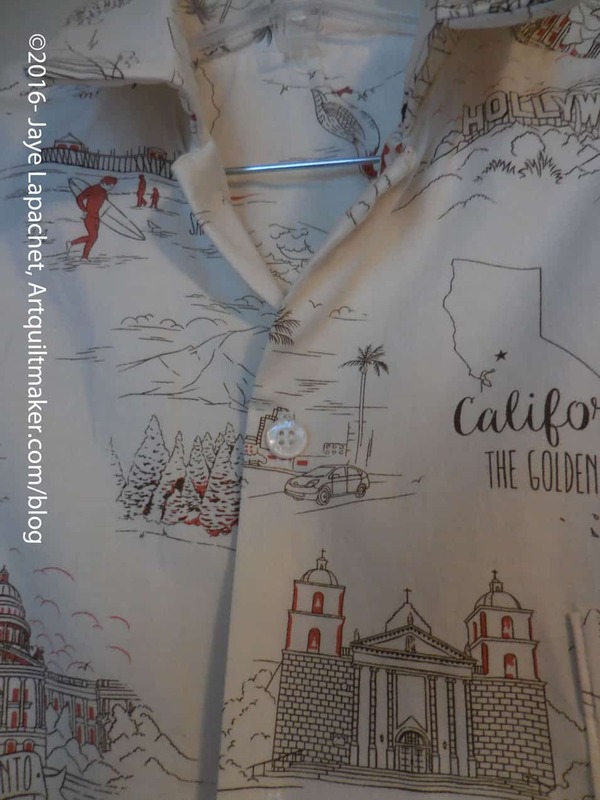 This was a particularly nice print of California fabrics and I just had to make DH a shirt. 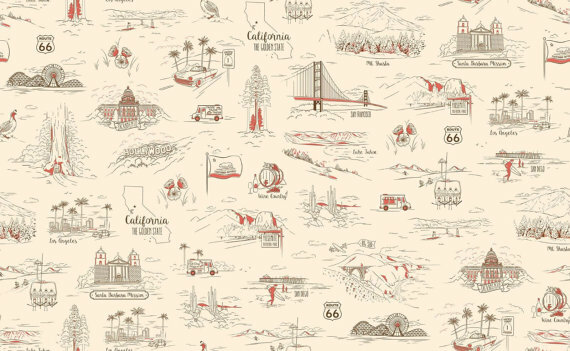 The motifs really depict California rather than being some kind of idealized version of California. I was pleased with the fabric design, because of the missions, which are a big part of the state’s history. Yosemite is depicted and the food trucks are a hilarious addition. He finds the tablecloth shirt I made too short, so I wanted to get it right. That is the kind of person I am. 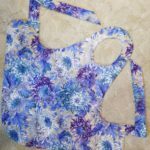 Have you seen how many Petrillo bags I have made? 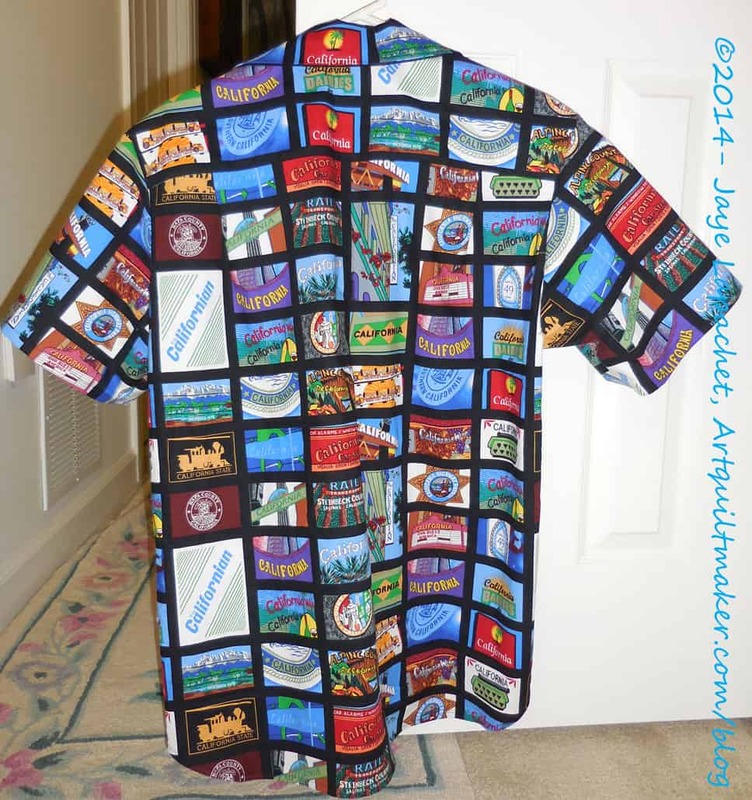 We made the whole shirt 3″ longer than the pattern said. yes, I learned to alter a pattern which involves actually dealing with the pattern, rather than just adding a few inches here and there. I think that next time, if there is a next time, I will make the inside seams French seams. I know I shouldn’t worry about raw edges, but I do. 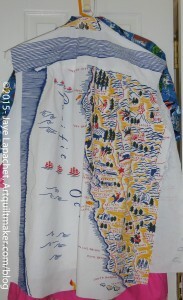 I am not even sure if French seams on a shirt are possible. I am sure they are, but may be ill advised for some reason. I started well in time to get it done timely, but really finished it last Thursday. I made the buttonholes using my little machine and sewed on the buttons. After that all I had to do was press and wrap. Well, I cannot seem to stay away from the garments. I am still not a confident garment maker and I couldn’t do it easily without my SIL who is a master (mistress??) of garment sewing. We are using the same Hawaiian style shirt pattern that we did when I visited her in Maryland a few years ago. I am using some great California fabric that I found at the Granary. 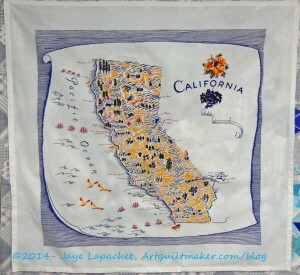 It is called California Here we Come by Studio 8 for Quilting Treasures. I bought 3 yards of the tan for the shirt. I knew I would need some extra and I didn’t want to run out in case I made mistakes. I thought the tan colorway would look good with the recipient’s coloring. I also bought a half yard of the black on white, which would be my colorway preference. 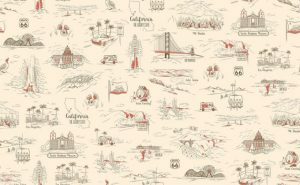 This is a really good California print as it has a lot of the sights of our state and goes beyond the most prominent. Whoever drew the print was thoughtful about the motifs. She is supervising me heavily and I need it, because I can’t get the layout of the pattern pieces straight in my head. 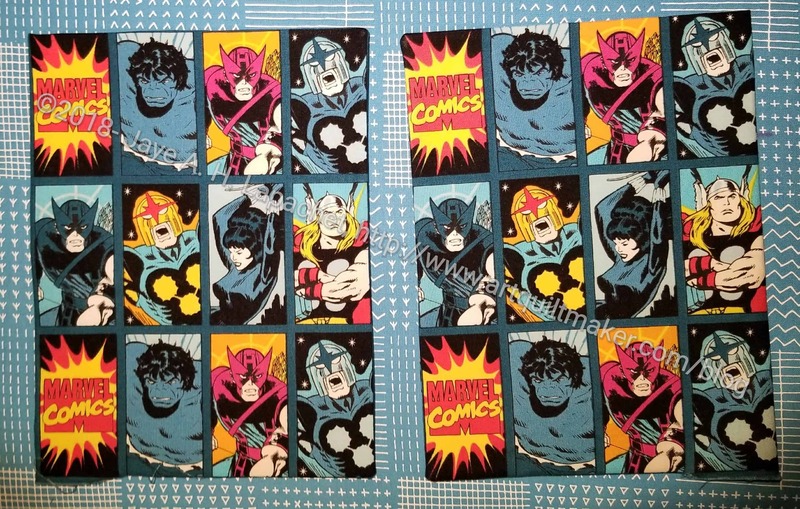 I only had to recut 3 pieces this time, which is an improvement. Now I have cut all the pieces and applied interfacing. I have also hemmed the shirt fronts. Onward. 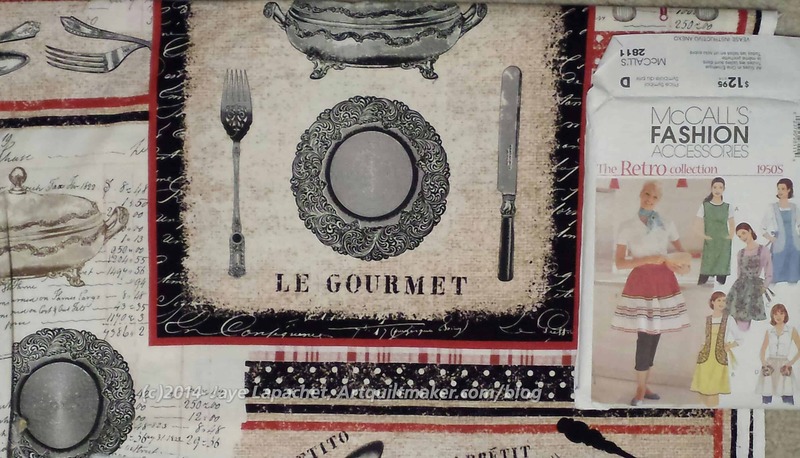 Sometime ago, Kelly supervised my work when I cut out the aprons. This apron is different from the Church Lady apron I finished. The pattern, which has gathers, is from McCall’s and is called Fashion Accessories “The Retro Collection” (#2811). I don’t remember when I bought it, but it has been around my workroom for awhile. 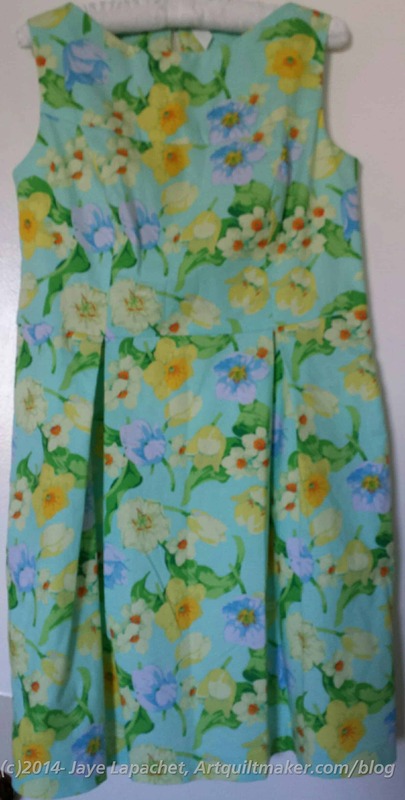 I think I might have bought it when I made my first apron in a garment sewing class back in the dark ages. I am pretty sure I definitely bought it before 2010. Too bad patterns don’t have some kind of date on them. Maybe they do and I didn’t see it. Fortunately, for you, it is still available. The link above is an affiliate link. 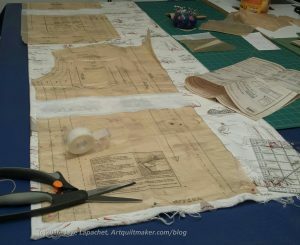 Mom was over and since I needed supervision for sewing this pattern, we started it. Altogether, the apron took about 3 hours to make. As usual, I sewed other things in between, like the pillowcases, so it took me more time, but not longer. 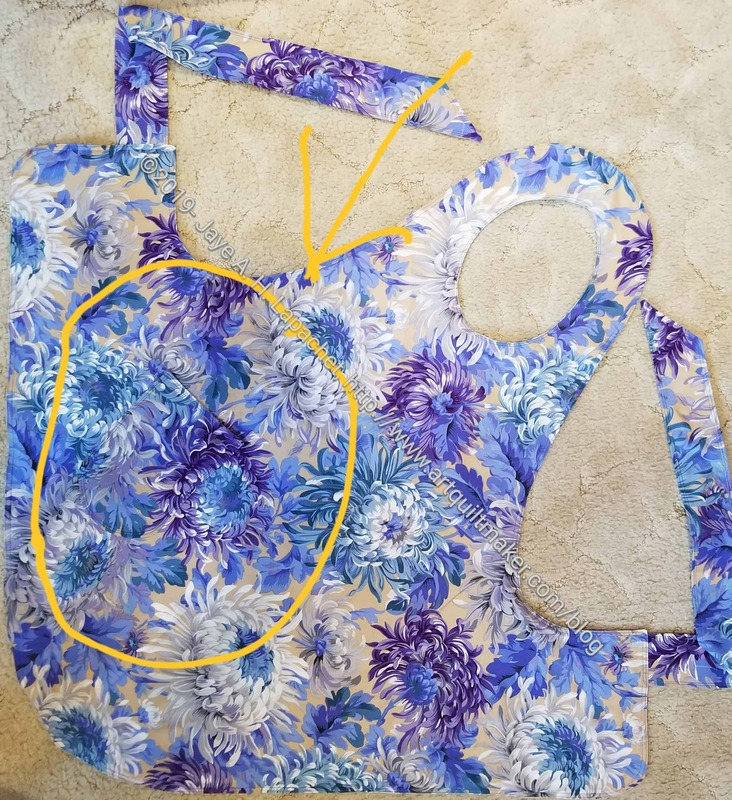 My dressmaker (for the Political Wifery dresses) has forbidden me from wearing gathers, so I was slightly horrified when I realized that this pattern had gathers. I also have never sewn gathers. My mom suggested we do pleats instead, which we started. Mom had to leave at this stage so we decided that since it was an apron and I would probably just wear it around the house, there wouldn’t be anyone to criticize the elegant styling. 😉 She helped me start and then gave me firm instructions. I think I did ok. Each time I got into trouble I texted her photos of my status and the relevant part of the directions, then we got on the phone and she told me what to do. What did we do before these technologies became available? Arranging the gathers was fine, but sewing over them was very strange. It was nearly impossible to keep everything lined up properly. I think I did ok, but it was slightly terrifying. I was afraid I would do something wrong. Mom helped me figure out the waistband, which is very clever once I understood the terminology. All in all, I am pleased with my effort. I’ll never be a really competent garment maker, but I can hold my own with some projects. Stay tuned for the final! After writing about the Fine Spring Day Journal cover, I went back and looked for a post about the dress made from the same fabric. No joy. I only found my post about the pattern. I thought I would close the loop and show you the dresses. In the interests of full disclosure, I did not make these dresses. I found a wonderful woman near my old office who not only can follow a pattern, but who is also able to take apart a garment and make a pattern from it. She has also altered a lot of my clothes as I have lost weight. I went to her to make these dresses, because I wasn’t prepared to do the work myself. These dresses have to fit and I have to look awesome, because, like a rock star, everyone wants to photograph DH and me. Also,, I didn’t think it could possibly be true, but found out that people were keeping track of my clothes. Life in the fast lane is such an adventure. Anyway, this dress made a sensation. I wore it to the Ladies Lunch at Grand Parlor and I looked really different than everyone else there. The awesome thing about this dress is that I felt great. 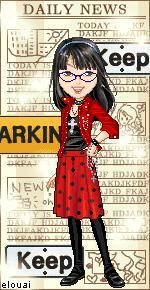 The style suited me. 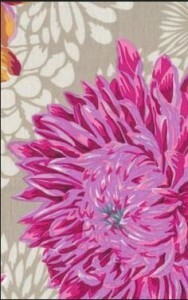 I really liked the fabric even though it was a bold choice and way out of my normal comfort zone. I felt confident and like I looked good. I kind of waited until the last minute to get these dresses made. I thought I would find something at a store, but I didn’t and went back to my original plan to get new dresses made. Yvonne worked like a champ and was able to finish two. The second dress was the test dress. 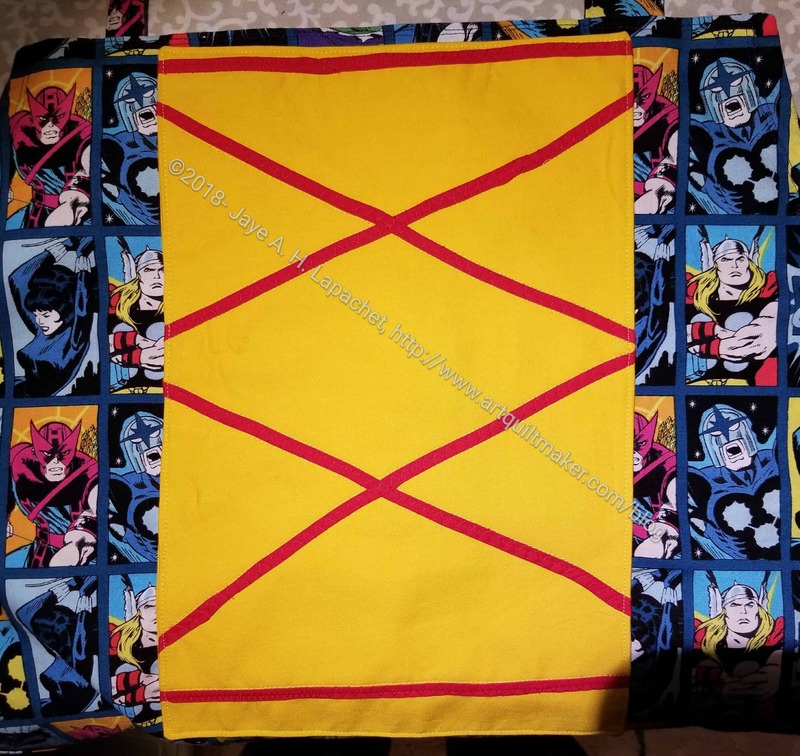 I purchased the fabric, because I love my pal Phil (Philip Jacobs) and this was a different choice for me for the back of the quilt. For a dress? CRAZY! I don’t think I have ever EVER worn a dress this color. Without the fuchsia flowers, there is no way I would have worn this dress. Again, I had the right shoes and I felt great. I have to find the right times to wear these dresses again. They are so memorable that people will remember them. I’ll have to pick the right event. When I need confidence, I will wear them.